To make the lemon-dill vinaigrette, place the vinaigrette ingredients in a bowl. Whisk together to combine. Set aside briefly. In a medium-sized heavy pot, heat two tablespoons of olive oil. Saute the couscous in the olive oil briefly until golden brown. Add 3 cups of boiling water (or the amount instructed on the package), and cook according to package. When ready, drain in a colander. Set aside in a bowl to cool. In a large mixing bowl, combine the remaining ingredients minus the basil and mozzarella. Then add the couscous and the basil and mix together gently. Now, give the lemon-dill vinaigrette a quick whisk and add it to the couscous salad. Mix again to combine. Test and adjust salt, if needed. 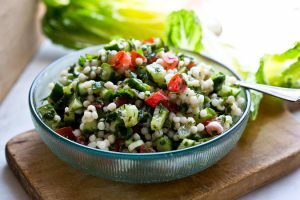 This entry was posted in recipes, salad, salad dressing and tagged crushed red pepper flakes, cucumber, dill, Israeli Couscous, kalamta olives, lemon, olive oil, salads, tomatoes by admin. Bookmark the permalink.